These 300 Kits can be loaded by dragging and dropping the separate *.NKI files or by using the snapshot function. Loops can be played polyphonically timestretched within a range of two octaves (24 semitones). Each part has it´s own color-coded range on the keyboard. You can alternatively play the loops sliced using the "SLICE" button in the SEQ page. There are special MIDI trigger keys/notes that enable you to turn on/off the FX per part, retrigger a currently playing slice (when sequencer is turned on) and to trigger a volume "trancegate" per part. 300 preset kits that guarantee instant inspiration. 1200 24 bit host-synced loops totalling 3GB. central mixing section with 2x parametric EQ per part. seperate edit, fx and sequencer pages. 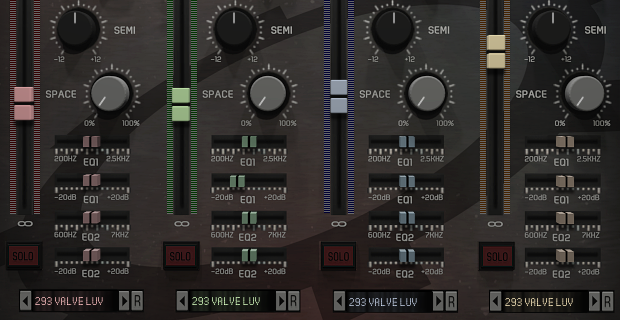 comprehensive effects section with 4x convolution reverb. per-part step sequencer with sample and loop offset. awesome editing and sound-shaping capabilities. mix and match loops for endless posibilities. fully ACIDized WAV loops ready for any DAW. BUG: fixed sequencer problems with polyphonic playback. CHG: removed FX toggle MIDI hotkeys. NEW: sequencer preset menu: added 8 user patterns. contents will be stored to disk. NEW: sequencer preset menu: added 6 pattern functions (reverse, invert, shift...). NEW: sequencer pattern recording (sample- and / or loop offset). NEW: MIDI hotkeys for sequencer user-pattern changing. NEW: MIDI hotkey for preview playback of all four parts at once. • REQUIRES FULLY LICENSED KONTAKT 5.5 OR HIGHER! From here you can mix and match the individual loops (parts). The top LCD shows the current kit or simply "---USER---" if you´ve modified (loaded another loop) the kit. It has no other functionality. You have 4 LCD´s that represent the current (loaded) loop. 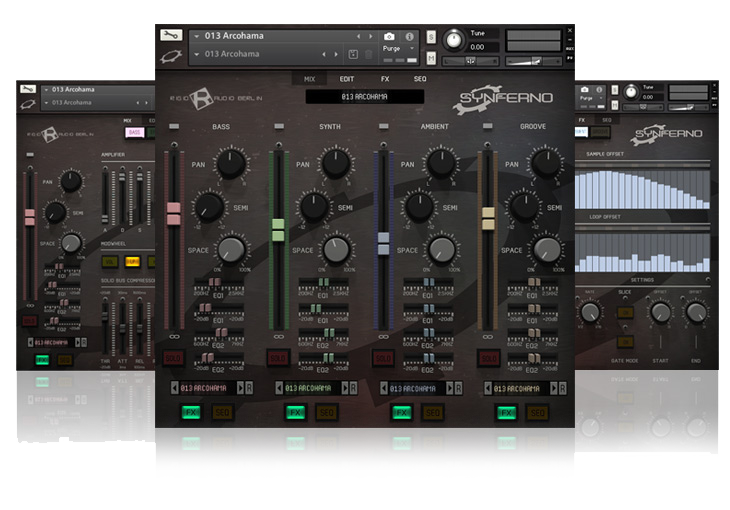 From there you can select different loops or let Synferno choose new ones by clicking on the "R" buttons. (Randomize). - NO KEY: chooses random loop from the part´s loop list. - SHIFT: randomizes parameters in the FX and EDIT page, as well as choosing a random FX preset. - ALT: chooses a random loop for all four parts at once. 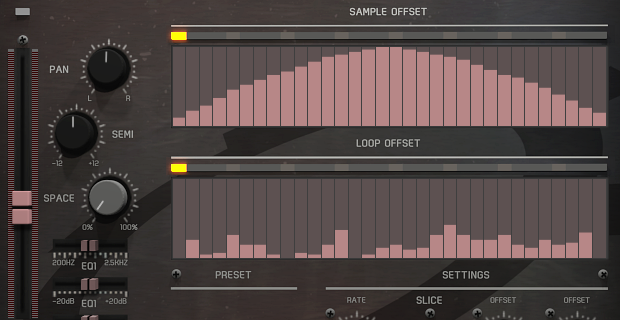 - SHIFT + ALT: chooses a random loop for all parts + randomizes FX and EDIT page values (random FX preset). NOTE: When you press SHIFT and ALT on the first "R" button on the mix page (BASS section) that also alters the sequencer state (on/off) + chooses a random sequencer preset for ALL parts. The SOLO buttons can be used to solo parts. Clicking any SOLO button with COMMAND/ALT or SHIFT will deactivate any active solo. For almost all controls you can press ALT and adjust the value for all parts at once. (It´s always stated in KONTAKT´s information window). COMMAND/CONTROL will reset values. SHIFT is for fine-tuning. The SPACE knobs set the amount of convolution reverb for the selected part. (The "SPACE" toggle button must be enabled in the FX page). The FX buttons can be used to enable or disable FX sections for the parts. The SEQ buttons will enable/disable the per-part sequencer. The STEP FILTER is a tempo-synced bandpass filter that randomly changes it´s cutoff. The AMOUNT controls the strength of the cutoff sweeps. The STEP GATE is a classical volume "trancegate". In the middle are on/off toggle buttons for the various effect sections. To the right is a preset menu with 32 presets and a "R" button that chooses one randomly. 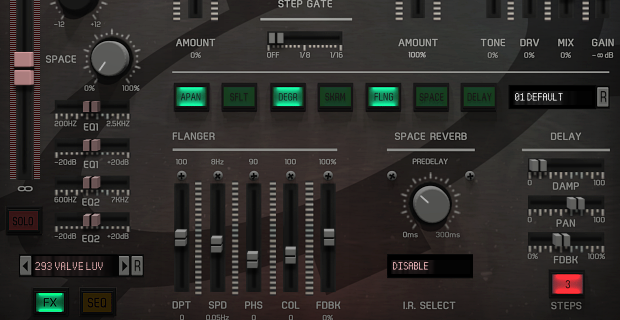 The SPACE REVERB comes with 60 impulse responses that you can choose via the dropdown menu. This convolution reverb is available for each part. Perhaps the most interesting thing in SYNFERNO. Each part has a 2 x 32 step sequencer that let´s you not only control the sample offset per part but also the loop offset. So basically it loads 32 loops per part into the RAM and then you can offset which one to play. (Really interesting results). - SLICE button: Let´s you play the first 24 slices on the keyboard of the selected loop chromatically. ("AKAI-Style").